On February 10, 2011, I was interviewed by Matt Monarch from Therawfoodworld.com. 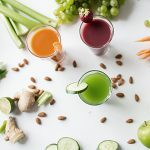 We discussed a variety of natural health topics, including the pro's and con's of colon cleansing and other body cleansing methods, tips to help you improve your overall health and well-being, as well as how to green your work and living environments. To learn more about Matt Monarch and Raw Food World, check out this post I did back in September 2010.